Dmitri Samorukov has been one of the best players for his team in a disappointing WJC for Team Russia. The Edmonton Oilers prospect scored only one point but looked solid throughout the tournament. 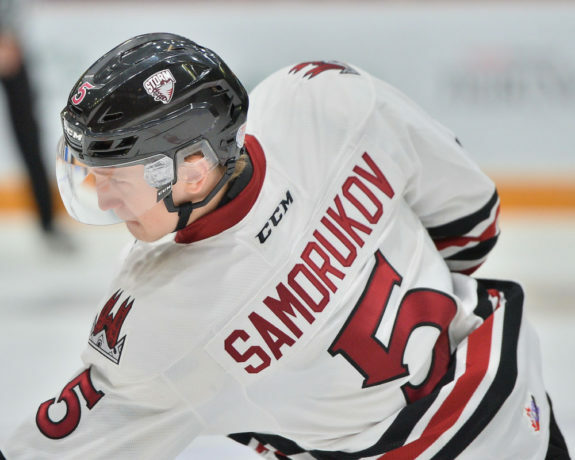 In this translated interview, originally appearing on the Russian website allhockey.ru, Dmitri Samorukov talked about his WJC experience, his contact with the Oilers and his move to North America at a young age. Anastasia Likhodedova: What do you think, what (did) Team Russia (lack) to go through the quarterfinals? Dmitri Samorukov: We had a good team. Probably the problem was in the special teams. We didn’t have special units for the power play and today games are 90-percent decided on the man advantage. We played like we were five-on-five. We should have scored more and conceded less. We also didn’t have good chemistry on the ice. We are sorry for our fans for such a bad tournament. It was bad for us too. AL: You were the youngest defenseman on Team Russia’s roster. How do you judge your performance? Was it hard for you? DS: Yes, of course it was hard. We had older players on the team, and they helped me. We were a family since the first day. Regarding my performance, I think that I could have played better. I could have helped more the team, both in special teams and on even strength. AL: It was your debut at the U20 level in an official tournament. What were your emotions? Was the tournament significantly different from the U18 WJC? DS: Both tournaments feature high-level players. In such tournaments there is a lot of attention to the detail, therefore it’s very important to play in the correct way. Make as few errors as possible. It was interesting for me to play alongside with guys who are now playing in the Kontinental Hockey League. And of course, it’s always interesting to play for Valeri Bragin. He’s a great coach, a true motivator. We had no problems with the tactical side. With Samorukov officially making team Russia, we have our final list of Oilers prospects competing at the WJC. AL: The coaches paired you with Anatoli Yelizarov and believed in your pair. How did you like playing with him? Maybe he’s a little slower than you. Did you feel that? DS: Yelizarov is a good defenseman. He was always helping me. If I wanted to skate forward, then he would stay behind. There was no problem at all with his speed. AL: You played your first three games better than the other two. How do you explain that? DS: I don’t really know. Maybe I was a bit tired. AL: Many said that Team Russia didn’t have the best defensive corps in the tournament. What do you think about it? DS: Objectively speaking, I think that the guys, including me, didn’t play the way they could. The coaches didn’t just take and pick us. They worked an entire year over us, then they also have other coaches’ recommendations, and stats. I think that the team was made up of the best players, we simply needed to show our best hockey. AL: Team Russia for the first time in many years got back home without a medal. How do you feel regarding this situation? DS: It was very hard. After we lost to the Americans, no one could talk in the locker room. We were sitting there and for like an hour no one had an idea about what to do. Now we need to think about it and not to waste the experience we gathered. We need to move on and progress. Now all the national teams have pretty much the same level of players and tactics and it’s never easy. AL: It has been said that you played with a shoulder injury. Now is it all good? DS: I suffered a small injury during a practice, but the doctors told me some exercises to do right after they had a look at it. 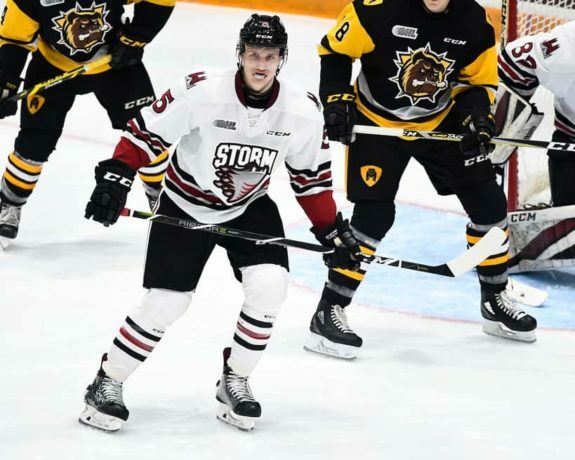 Now all is OK.
AL: You’re now playing your second season for the Guelph Storm. How is your season doing? DS: We have a good team but sometimes we had mistakes on the tactical side. We’ll try to correct them. We still have the second part of the season in front of us. It’s early to forecast anything. AL: Didn’t you ever think that you left too early? DS: I regret not moving earlier. If I was smarter, then I would have been studying English at school. I would have been here already knowing the language. When you move without knowing the language, it’s hard for the first few months. I learned the language working with a teacher. It was even laughable during the first few weeks: the coach would talk through an interpreter, or even drawing something for me only. But then my teammates helped me, and I had some Russian people I knew in Canada, now everything is ok.
AL: Why did you decide to move? DS: I played my whole life for CSKA Moscow. So I understood that if I wanted to achieve something big I needed to move further and start playing in the Canadian junior leagues, then trying to get in the AHL. I was fully aware of the fact that if I stayed with CSKA Moscow, then I may not get a chance to showcase myself. And differently from Russia, here in Canada I work on myself, there (are) people helping me and I can fully focus on hockey 24 hours a day, progressing faster. AL: If a KHL team calls you now offering a contract and a spot in the lineup, would you accept? DS: I’m under contract with the Oilers now, and I can’t do anything else. AL: What if it happened before signing with the Oilers? DS: I can’t reply, frankly. I have a goal: to move to America to play in the best league in the world. You can always get back home, but playing overseas is an experience that you can’t miss. AL: I’ve been told that Canada didn’t meet you in the warmest way. Was your first season that hard? DS: We had the worst team in the league. We won only 15 games out of 68. When your team loses, you’re going to have problems. You can’t play alone. But now the team is different. AL: Didn’t you think about moving to a better team? DS: You need to go through those hard periods. We had a very young team, that’s what happened. This year we’re better as we have more experience. And I think that next year we can be a Memorial Cup team. We need to gather more experience and I don’t intend to abandon the ship. AL: What do you miss more than everything living in Canada? 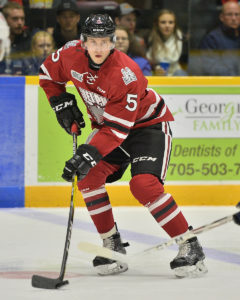 Dmitri Samorukov of the Guelph Storm. Photo by Terry Wilson / OHL Images. DS: My family: my parents, my grandparents, my brother. I would like to spend a night dining with my family, but they understand. I’m always busy, but I choose this path myself. AL: Can you tell us more about your sports family? DS: My mother was a diver, my father was a professional footballer, a known goalkeeper. My brother also played football, for CSKA. But he retired and became a policeman. AL: Your family excelled in different sports, why did you choose hockey? DS: My brother wanted me to play football. I tried, and played in the football section, but as I was a big guy I had some difficulties in breathing and I was told that I would be better off playing hockey. My mother agreed on that, she wanted me to practice some sport. I started playing for the White Bears, and then I passed the very first try-out for CSKA. AL: You were born in a non-hockey city, Volgograd. DS: My father was playing there. Then he moved to Khimki and my mother decided to move to Moscow. I was two or three. AL: You were drafted by the Oilers. Is your goal to get a spot there? DS: I need to work first, then the people who follow us will decide. Of course I set for myself the goal to play in Edmonton. But at this point I am more focused on my development and in having fun playing hockey. AL: Did you talk with the Oilers head coach? DS: I managed to talk with him during the summer camps. AL: Did he give you any prospect? DS: Of course, he told me to work hard, that next year we’ll have a chance and that we should use this year to get everything I can from the Canadian Hockey League. AL: Did you manage to attend an NHL game? DS: No, I did not. Sometimes I watch one period and then I go to sleep. I try to follow the Oilers as closely as I can, I try to understand where I need to work to become better. AL: What Oilers player do you follow more? DS: I follow every Oiler. Especially defensemen Darnell Nurse and Kris Russel. Regarding other clubs, Erik Karlsson. I try to follow the way he plays in the offensive zone. I also follow more defensive players.